It's no surprise 2017 is still lowest on record, according to the PIOMAS model. If during the last week of April the Arctic wouldn't have cooled down (somewhat) like it did, the gap with previous years would've grown even bigger. But as it is, things haven't changed all that much since the end of March. The lead over number 2, 2011, has decreased from 1731 to 1642 km3. The difference with record low year 2012 (at the minimum) is practically unchanged. And now for that maximum. There is no barrier of multi-year sea ice in the Beaufort Sea whatsoever, and a lot of three-year ice is poised to be pushed out of Fram Strait, while the thickest ice could be squeezed through the garlic press of the Canadian Archipelago again, as well as Nares Strait (where no arches have formed this winter). Not looking good. Not looking good at all. There are clearly myriad of ways by which the 2017 melting season could break 2012's record low minimum. If this year's melt is equal to the average of the last 10 years, there will be around 2500 km3 left in September (mind you, the 2012 record low minimum is 3673 km3). If there's as much melt as in 2010 or 2012, this year's minimum will barely go above 1000 km3. I don't want to know what the Arctic looks like if that should happen. There's nothing else to do but hope that PIOMAS has it completely wrong, or else pray for lots of cold and cloudy weather in the Arctic this summer. 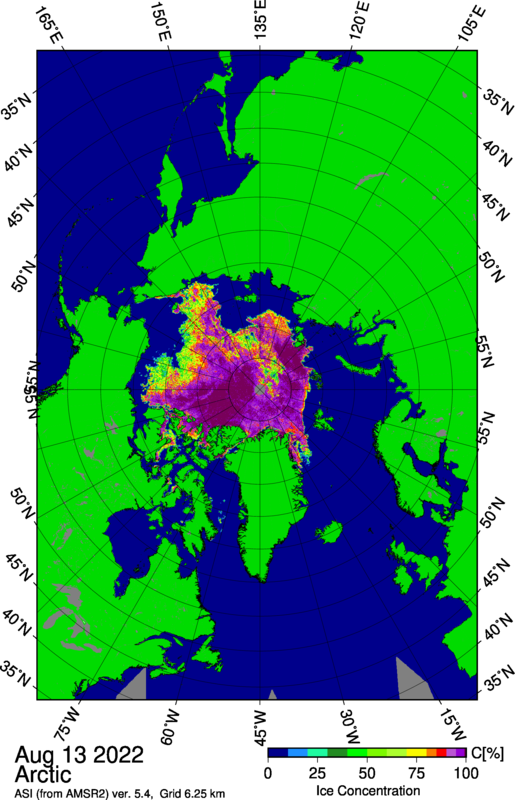 PIOMAS is not wrong at least wrt Cryosat2, the last comparison of user Steven over the Forum shows pretty consistent distributions except for the ice "blob" which position is off. The only positive thing is that they both agree in > 2 m thick ice in the Eastermost part of the Beaufort sea. Quite espectacular recovery, we will see if it serves to slow down melting. Well, nice job as always Neven, your updates are really welcome. The CFS v2 model continues to forecast high pressure over the Arctic ocean for June. Model predictions are consistent with the ongoing evolution of weather patterns we are already seeing. Perhaps the model will be wrong but it looks like a warm and sunny May and June with high pressure over the Arctic ocean. The stratospheric polar vortex was displaced multiple times this winter but the cold center held. In June 2013 persistent low pressure in the Arctic followed a strong sudden stratospheric warming in January and a very weak jet stream in late spring. This year we have seen the polar vortex hold together and the jet stream has been relatively strong. I think that the CFS June forecast will verify. -FishOutofWater, known in real life as George. I have not much hope that a new record low volume can be avoided this year. But I see a good chance that next year won't be this bad, just as 2013 and 2014 stalled the downwards trend after the record low of 2012. Of course, in the long or even medium term, the arctic ice will continue to shrink, but maybe the politicians have fully woken up to this development until then. How can you crack and fail? "Eastermost" as in "next to the CAA"? But even then, it wouldn't be protected by a strong barrier that used to be there, it would be the remnants of such a barrier. As in, a 100 to 200 mile wide strip next to Alaska/Canada border; Mckenzie mouth; Amundsen Gulf and North of Banks Island. The chances that this would resist after a warm May and June combined are slim, let's put it that way. But, FYI and all, worth noticing 2 to 3 m thick ice over all that area. You guys haven't even thought of certain other ecological consequences of melting land glaciers and permafrost. You see, there are countless species of microbes, trapped in these locations, which haven't been part of the open environment in hundreds of thousands, perhaps even as much as two million years. Some of these microbes won't be adapted to surviving in the modern oceans, lakes, and rivers, but some of them will be adapted enough to survive, and will begin to compete with modern microbes for nutrients and territory. Will they have beneficial traits, such as metabolizing methane or CO2? Or will they have negative traits, such as producing toxins, or more Methane and CO2? Ice and low nutrient water in the Arctic has limited the formation of toxic algal blooms that frequently form at river mouths. But that might change. Arctic ocean water is prone to acidification because CO2 is more soluble at low temperatures and because there is a large supply of organic carbon in the water. The extremely low ice volume and ice thickness at the start of the melting season means that biological processes will get a very early start if melt ponds make a strong start in May. We need to watch the beginning of melt pond season this year to get an idea of how thin the ice will be by September. Yes, a record low minimum could have effects on the ecosystems of the Arctic. I wonder how long it will take for birds and other animals to carry grass, shrub, and tree seeds to Antarctica so that a temperate ecosystem can evolve there? In the western pacific, there is a volcanic island forming near Japan, or maybe it was the Philippines, I forget, and scientists quarantined the island so they can observe it to see how long it takes flora and fauna and microbes to colonize the island and start its own unique biome. Similar studies were done in the past at Krakatoa and again at Mt. Saint Helens, after the horizontal blast and lava floes life-wiped much of the area. It was once stated by a Geologist that you could walk out onto the lava field, and there was no sound of anything living at all, not even an insect. In the past, some animals have migrated very long distances ni relatively short geologic time. Take the North American Camel, which eventually went extinct in North America, but not before migrating to Asia and Africa, into a climate the opposite of what it evolved in. It was born in the frozen tundras of Canada during the last ice Age, but now lives in the deserts of Asia and Africa. They also thrive and destroy the environment in Australia, where humans introduced them during the colonial period there, not realizing they would run out of control and consume all the wild vegetation. For this reason, the Australians hunt wild camels just to reduce their numbers, to keep them from out-competing the native species for food and water. Now on the other hand, the Penguins of Antarctica are the descendants of what used to be a tropical bird species. One wonders how they will evolve and adapt whenever a few percent of the Antarctic ice melts, and climate and biome behavior along the coast there is no longer the same? Can Penguins re-evolve temperate or tropical favorable characteristics? Wade, could you stay somewhat on-topic (PIOMAS and conditions in the Arctic right now) or else go to the Arctic Sea Ice Forum? By sequentially going through the colour schemed dates on the PIOMAS average thickness graph I observe 2010 as being of some relevance. This is because apart from the years 2014/15 it seems to have provided some type of long term effect. I plan to find out what happened in 2010 and come up with a theory. inferring a bright white insulation delaying onset of a super melt. I am quite pleased unusually cold sun disk data reflected this cooling in the atmosphere, as early as mid March, to what we now see on the surface. At present being on course for a foggier cloudier early melting season start, alas to take a steep quick turn for the usual great melt when snow turns to water rather quickly when average surface temperatures approach the 0 mark. Snow has not the staying prowess of sea ice., but replaces it when very deep. Check out the Dosbat blog. Chris Reynolds wrote at length about 2010 wrt PIOMAS. Looks like it going to be a test of NSIDC (extent graph) against PIOMAS (volume graph) this year. Neven you cut the history for PIOMAS at 2007, but I would love to have seen 2006 too. Whilst the other charts are wonderful and give a great picture, the Chartic extent graph shows that 2017 is currently 3rd lowest, behind 2006 and 2016. The 2016/17 winter continues to roughly track the 2006/7 winter on extent. The story is that the extent is not that far away but the volume is way lower. You show this clearly in your charts, but the extent/volume of the pair of winters 06/7 and 16/17 would also have shown the dreadful state of the ice. Last year I was talking about 2006 and how the year closely matched 2016 and how that season would unfold. It turns out I was right in most essential details. Lucky guess maybe. One of the points I made last year was the effect of a lot of open water, early in the season, to the atmospherics of the Arctic. Namely too much moisture so lots of cloud and weather in the June/July timeframe. The snow, as wayne clearly points out, added to the April cool down, will stop the formation of too many open leads very early. Whether this leads to exceptional melt in June and July is yet to be seen. Also we now have a pattern of storm in August. I must admit I do wonder what the result would have been in 2007 if there had been a GAC in August. Hans and I have been ruminating on a cyclical melt which is evolving. We are looking at a 5 year cycle but I'm also looking at two back to back 5 year cycles encapsulated in an overall 10 year cycle. Little to prove it but there are some fringe articles out there on cyclical melt seasons in the Arctic. However, to me, Solar and El Nino sit about exactly where they were in 83/4. With one big difference, El Chicon and it's knock on cooling influence. It will be very interesting to see. We are both at record CO2 and record CO2 growth year on year; added to record low volume and near record low extent. We are, I believe, at the end of a 5 year cycle which tells me that we should get exceptional melt; preparatory to dropping into a 2 year pause (let's not call it recovery or re-growth). But also at the same point in the solar cycle as we were in 2016/17. I wonder, is this another significant marker on the way to blue ocean, or is it the end of an evolving theory? Another 6 months will tell. But, I must admit, it's not looking good for the ice. Just to clarify, when I say extent tracked. I mean the shape of the curves and how they unfold. The values are different, it's lower than 2007 but not by as big a difference as it started 2017. "Hans and I have been ruminating on a cyclical melt which is evolving. We are looking at a 5 year cycle but I'm also looking at two back to back 5 year cycles encapsulated in an overall 10 year cycle." Should prove very interesting, NeilT, to see if the repeating 5 year pattern holds, i.e. breaking 2012's record minimum, then starting the cycle over again. Sure is set up to do just that this melt season but like you mention, another 6 months will tell. Worldview looks absolutely horrible at this point in time with the gyre producing a crack that almost stretches to the Lincoln Sea: I bet next months PIOMAS will be awful because of this exact point as disintegration is well under way already! My best guesstimate is 300 nautical miles?! But also, isn't it a tad early for there to be areas of open water in the straits between Greenland and Ellsmere Island? It often does this at this time of year. Must be atmospherics and persistent wind. However the length and width of the crack is growing dramatically over time. This can only be down to the reduced volume and cohesion of the ice where it should be thickest and strongest. I'm sure it will close in the next 6 weeks or so. I'll announce overall steep downward loss of sea ice trend when it hits, we not quite there yet, but break ups like the one you presented is very 'a propos", and will be the norm because the ice as per your example, is glued together by thin leads covered with lots of snow, It may seem solid, but it is in a very fragile state easily broken up. A bit higher temps and sea ice armageddon will start. By the way, there is no chance of 4 C warmer top of sea ice or snow than surface temperature as per Buoy data at times. I would suggest transparent alcohol thermometers on a webcam :), they exhibit the least affectation by sunlight, not they are impervious to sun rays, at least they don't go as wild as thermistor do with photons. I'll have something on this soon. "Hans and I have been ruminating on a cyclical melt which is evolving..."
Gents, I've just posted something pertaining to this idea on Espen's IJIS thread (#4260) on the ASIF. You're brave Bill. The last time I pushed a 5 year cycle on the forum the negative responses ranged from queries as to why I was even allowed to post on the forum to outright requests to ban me. I no longer comment on the forum. Self imposed, neither Neven nor the admins have banned me. Having read your post I'm not surprised that you can't find a correlation between the tracked data and El Nino. None of that made sense to me until I did the following. Still it did not make sense until I mapped VLE5 volcanic activity on top. I only took notice of medium to strong El Nino's and I also mapped the length of Each Nino too, because some are much longer than others (the latest having appeared and grown then died over a 3 year period). Putting all that into the mix, negative for the Nino's, positive for PPM growth, Nino strength and Solar input and it made a bit more sense. What I did not do is map purely local impacts like the Russian and Canadian forest fire hectare burn and the direction of the wind. I'm pretty sure that if you have all of the relevant data, including atmospherics, prevailing wind, tropical storm influence and any other key factors such as snow depth in spring, then the whole thing will make a lot more sense. I don't believe it is so much chaotic as that key influences are not fully understood, or should I say mapped comprehensively rather than independently. Take last year for instance. I unearthed a paper which was studying the impact of leads and open water on the atmospherics of a melt season. But the article was only focussing on summer and the effects of the leads at those times. However if you read at a higher level, the leads were causing a lot of moisture which was trending towards moisture and cloudiness that blocked direct sunlight led warming. Take that same effect and put it on the scale of 2016 and you wind up with a June/July slow down, just as we saw in 2006. Now conditions are unfolding much like 2007. So if we want to do some crystal ball gazing, we could postulate a 2007 style melt year with an end of season like 2012 onwards, such as great storminess which is now such a feature. Of course if we looked back at that study of leads, it also mentions the atmospheric impact of all that moisture (localised storms). After all it is a heat transport event. Since last year. Given that we lost the CT area it's the best single source I can use without getting into too much data. I remove all but 2006/7 and 2016/17. Then zoom in. I don't try and divine the actual numbers, that's not my purpose. What I'm looking at is the relationship between 2017 and 2007 and how 2017 compares to 2016 in comparison with 2007 to 2006. If you do that you will notice some interesting parallels. Of course 2016 being such a more extreme year than 2006 and 2017 having started the year as the lowest extent in the satellite record, makes comparisons a little hard, but that is the nature of comparing the same impact on a downward moving trend. However I see similarities in behaviour over some weeks. Sorry that should be positive for the Nino's and negative for the Volcanic... Should review more carefully. Interesting correlations, NeilT. For my part regarding the 5 year repeating cycle, I readily admit it is simple observation - the big picture if you will. 2017 is exciting from the standpoint of whether the pattern will repeat with a new record minima or if the pattern will alter. Once we do get to a blue ocean event it seems likely the 5 year cycle will be replaced by repeating blue ocean events, occurring earlier each year. But I'm not figuring on that this season, but do anticipate a new record low. I’ll admit my forecast back then was partly based on a well written Master’s thesis, but I happened to notice that SSTs off Florida this year in May have been above average. I do not know if this is enough to lay the Beaufort blank and blue later this summer, but statistic certainly point that way. I’ll leave the forecast here for the time being, but may return to it later, if some of this turn out to be true again. That's very interesting, P-maker and NeilT. As you say, putting the words/idea out and waiting to see how it develops is the thing. Your logic makes sense to me. At my amateur but fascinated/obsessed level, I've been looking at things like this daily, and noting the extreme variation in temperatures, sometimes from day to day. But the steady incursion of warmth from the N. American/European side into the far north (especially Svalbard) is there. On the whole, it appears the north is a bit cooler now relative to the norm that it was a couple of months back. But the daily/weekly variations are best subsumed into a broader longer observation for the formation of conclusions. You better hope God doesn't answer that Polar Bear's prayer, because if he does, humans might just go extinct! P-maker, not sure there's much going on in the Caribbean right now with sea temps. Buoy's and on shore data aren't showing any thing going on with regards to SST's. Not so sure about nullschools SSTA on the westcost either.They're showing above avg temps and buoys'and shore data show the opposite. Useful real time arctic temp map. P-maker, this will give you a little better overall SSTA idea. Click on the SSTA image on the right. I had been looking at products such as this: http://www.ospo.noaa.gov/Products/ocean/sst/anomaly/ from time to time over the first half of the month and noticed in particular the huge red blop east of Florida. Let's wait until the end of the month and make sure all available data is in and the reference period is okay. Look of ice in false color Bremen has been lightening up rather dramatically past few days. The snow is melting. We should see some significant melt ponding in the next month which will confuse the Area figures for a while. It's fairly clear that there is a strong trend coming in from the Pacific side with the Atlantic slowly warming. If it goes clear skies June/July, it's going to be fairly dramatic. April and May ice metrics for the Arctic are not good predictors for the August - October conditions, so I wouldn't worry too much about it anyway. Wade, 2007 & 2012 were record lows in September, followed by years of rebound followed by years of descent. Since 2012 has followed the same 5 year cycle, and so NeilT & I expect either a new or near record low in this 5th year of the cycle, 2017. I personally have already predicted via a YouTube video (done by a friend of my mine) posted at the end of the 2016 melt season of 2.5 km3 for this coming September low. Predictions are of course risky but it's based on the repeating 5 year cycle. I certainly haven't expected a complete meltdown by now and don't expect it this year either. I'm not predicting anything really. But 2017 is shaping up to be quite like 2007. The main difference being that there are so many more areas where solar insolation will actually wind up in the sea through the ice due to such thin ice. In the end the biggest single factor will be the weather. But I have noticed that extreme weather events during a time when melt is reducing (as in the 5 year cycle Hans and I talk about), tends to lead to no records. However get that same extreme weather at a time when melt is increasing and the results are fairly dramatic. To align my vocab. Complete meltdown is catastrophic. Dramatic is significant melt which creates new records and does damage to the long term longevity of the ice. I'm working on 2022 for catastrophic. But I'm open to surprises, either way. We have bigger problems in the world than AGW. I just saw a news segment on television about a Basketball player who is going to be paid $30 million per year. Any rational civilization would take away at least 90% of that via taxes, and redistribute it to normal people through income supplements, housing programs, or medical care, or whatever. Seriously, if we can't get a government to pass rational legislation for taxing the sinfully wealthy entertainers and athletes, and we can't get a rational law against drugs and alcohol abuse, then who are you guys kidding thinking any government is going to do anything regarding CO2 pollution? lol. Not happening. Wade, the topic of discussion here is simple; of and or relating to the latest information posted above by Neven. We all try our best to stay on topic. Maybe you can try the sea ice forum and start a new topic. The link is on the right side near the top in a round patch of links. Okay, I'll respond to what he wrote. I don't find PIOMAS that useful, because it's a computer simulation of volume, rather than a direct measure. Further, lines of regression for Volume call for a complete summer meltdown by 2022, but regressions for area and extent still need several decades. If the PIOMAS were reliable, it should produce a regression similar to that of the Area, which I consider Area to be the most reliable metric. Wade, can you calculate for me the difference in volume and area between a floe that measures 10 km by 10 km and is 1 metre thick, and a floe that measures 10 km by 10 km and is 10 centimetres thick? My calculator says 100 km2 and 0.1 km3 for floe 1 and 100 km2 and 0.01 km3 for floe 2. So, area stays the same, but volume differs by one order of magnitude. Does that perhaps explain the difference in regression? Or, as Peter Wadhams said 10 years ago: "In the end, it will just melt away quite suddenly." Not entirely. Intuitively, the Pole itself should be the place where the thickest Ice remains, but in the real world the thickest ice hangs out a bit south, between the Pole and the Greenland land mass. I had previously stated several years ago, here and elsewhere, that the Greenland Ice Cap would serve as a "buffer" against a complete meltdown of the Sea Ice, for a number of years, due to several effects: Melting or collapsing land ice cools the SST, land and land ice modifies both the winds and the ocean currents so this thickest ice is protected. Land ice is thicker, and also provides less albedo feedback from melting, so melting of Greenland doesn't accelerate further melting of sea ice as much as the other way around, and so forth. Oh it will suddenly be gone, some day, in some year. However, if you look at the "mean thickness" from the Pijamas graph you posted, that also implies a longer regression period than does the PIOMAS projection alone: 17 years or so. It usually takes 3 to 5 years for a new record low in Area to be verified as the new "normal". So maybe the really weak recovery of Northern Hemisphere Sea Ice from last year is an indicator of a threshold being crossed which will greatly increase the melt rate in the next 5 years or so? Let me first make clear that I'm not saying that I think that an exponential or linear extrapolation of PIOMAS volume data is correct and that the Arctic will be ice-free for all practical purposes by 2022. There will indeed be a refuge of ice that might be hard to melt. If one long-term metric goes down much faster than the other, as is the case with volume vs area, by definition regressions or extrapolations cannot be equal. It also doesn't mean that one is better than the other. Just as the Arctic might not go sea ice-free by 2022, it will highly likely not melt out 'several decades' from now either. And no, average thickness doesn't imply a longer regression period either. Just look at 2012, lowest volume and area/extent minimum on record, but average thickness was similar to other years. You could have just one slab of 100 km2 left, but if its volume is 0.15 km3, that means it's 1.5 metres thick, which would be 0.5 m thicker than the lowest years on the chart. So, I don't find that a good argument for saying that PIOMAS is unreliable. It may be unreliable, but not for the reasons you state. It is not mathematically possible for both area and volume to decline exactly linearly unless thickness remains constant. Whilst I have been openly critical of PIOMAS over the years, volume is, in the end, the only reliable indicator of the actual state of the ice. I do believe that the modelling aspect of PIOMAS tends to leave it overestimating ice at certain times. But, whenever it is validated against satellite data specifically designed to measure age and freeboard of ice, it correlates roughly. 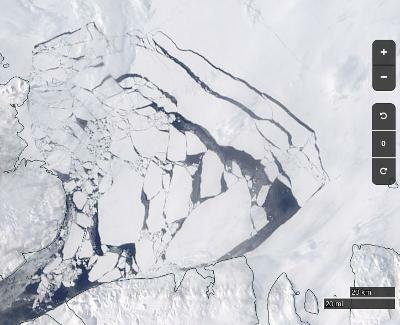 The biggest potential fubar in the whole thing is Dr Barbers observed "rotten ice" which causes backscatter like 5 year ice and freeboard like 5 year ice but is not solid and is easy to melt and fade away. As for my definition of catastrophic, everyone who talks blue ocean talks about ~1M KM^2 or somewhere under it as blue ocean. I am the same. The day we see totally ice free in summer is more than one decade away, I believe, but catastrophic ice loss which will heavily impact climate and ice balance in the Arctic is, in my estimation, much closer. Close enough to be just one more half decade away if it continues to follow some kind of cycle. All the measurements have value. Extent tells us how far the ice extends beyond the pole and how much is both insulated from the cold and protected from insolation. Area tells us how compacted that ice is and how much energy may transport, either way, during the seasons. Volume tells us how much of our planetary cooling budget was burned in any one melting season and how much re-grows in the freezing season, or not. Which, in the end, is the real horseman of the apocalypse as far as AGW is concerned. Both the Chinese and the Japanese have recently successfully mined Methane Hydrate from beneath the sea floor. From 80 to 800 years worth of natural gas are believed to be available under the world's oceans! There's 2.8 quadrillion cubic meters of natural gas available to make cleaner burning natural gas powered autos, trucks, forklifts, etc! "The day we see totally ice free in summer is more than one decade away, "
I would agree, but not for most of remaining sea ice, think 2007, with a lot more sea ice than now, yet a massive meltdown occurred where the thickest ice was. 2007 marked the beginning of the end, when anything can happen fast. I do agree that Greenland and Ellesmere stands in the way for a complete disappearance of sea ice, the extreme image of complete blue Arctic Ocean is a bit far away, but 80% gone at minima is not impossible this or any other year after 2017. Wayne, let's see what winter 2017 and the 2018/19 freezing seasons bring. I expect the Daily Fail to be ranting about "recovery" by February next year. But, in general, it looks like 2017 is another long step on the road to destruction. Wade, this was always going to happen. Forget just cleaner burning, methane has the potential to produce all the synthetic oils we need and China was always going to try and reduce it's dependency on imported oil. The irony is that we can forget the methane clathrate gun hypothesis for now; we, humans, will create that disaster ourselves without the need for nature to take a hand at all. Clever little monkeys aren't we? a new sea ice world, more fragile than ever, at the brink of chaos to be caused by a normal summer. Unprecedented is the norm. CORRECTION / CLARIFICATION: It is not mathematically possible for volume and area to both simultaneously decline exactly linearly to 0, reaching 0 simultaneously, unless the average thickness remains constant until volume and area reach 0. It is also not mathematically possible for volume and area to temporarily both simultaneously decline exactly linearly, before or without reaching 0, if the corresponding lines project forward to volume and area reaching 0 simultaneously, unless the average thickness remains constant during that temporary period. PROOF: The proof is trivial, as math goes. Note that Average Thickness = Volume / Area. If Volume, V, is declining linearly and hasn’t reached 0 then, during that time of linear decline, V = - c t + d, t = time, c > 0, c & d are constants. If Area, A, is simultaneously declining linearly and hasn’t reached 0 then, during that time of linear decline, A = - e t + f, t = time, e > 0, e & f are constants. If that linear trend in V projects to V = 0 at time T then 0 = - c T + d, d = c T, and V = - c t + c T = c (T - t) during that time of linear decline, with T a constant. If that linear trend in A projects to A = 0 at time T then 0 = - e T + f, f = e T, and A = - e t + e T = e (T - t) during that time of linear decline, with T a constant. In that case, Average Thickness = V / A = (c (T - t)) / (e (T - t)) = (c / e), a constant, during that time. I wrote my previous comment in haste, and I realized shortly thereafter that its wording didn’t precisely reflect what I meant, but I wasn’t online again until now. Wayne, come October, come to our Open Studios (Fort Point) and introduce yourself. He's referring to our unusual heatwave, 3 days 92,95,90F (33,35,32C). Since the season has been more normal in the last couple of months, I was discounting that. While these extremes occur and fake skeptics play in the mud of uncertainty, it is certainly a data point when extremes that far out of the norm occur. Extrapolating to our planetary circulation, I've been using Nullschool to observe the narrower- and broader-focused variations, and a bit surprised to find the spikes so common. Boston area is nice in the fall , but I will be in the High Arctic at that time. Thanks for the invite though. even compared with the previous 5 years, a location currently having broken up sea ice where it never happened year round. Wayne Kernochan, that was. But all welcome, it is a public event. That said, that Nares imagery is instructive, thanks. which follows a beautifully constructed NYTimes Antarctic article. Wouldn't it be nice if we could put a GOES-R series satellite in a Polar Orbit and use it for tracking the weather and ice evolution? The massively enhanced resolution and frame rate at such a low orbit would mean weather data for computer models would be radically more accurate and precise, and we'd get something like 256 pixels on the Sea Ice and Continental Ice for every one pixel we currently get. In other words, it doesn't make sense to launch the 4th satellite of each generation into a Geostationary orbit, as a "backup", and then never use the thing; It may as well have been launched into a Polar Orbit and used continuously. After all, if one of the Geostationary orbiters fails, you can always still use the Polar orbiter's data, and you can always revert to using one of the older model satellites in space for that position, worst case scenario. A mini-debate has started on the IJIS thread of the ASIF concerning air temps above ice. As this is a subject on which you have commented several times on the ASIB (unless I've mis-remembered - an increasingly common event these days, I'm forced to admit) perhaps you might care to share your thoughts on that thread? I like your idea, Wade! We need to be able to analyze the ice at a much more detailed scale. More pixels, much greater resolution! Use that satellite. Note that the GOES series of satellites use a geostationary orbit at an altitude of ~35,800 km whereas Suomi NPP uses a sun synchronous orbit at an altitude of ~834 km. The two are not readily interchangeable! Article about reasons why Chukchi melted early this melt season. Discovery of massive ice loss in Greenland when temps are high enough like they were in 2010 & 2012. "The rapid recent decline in ice coverage and thickness has led researchers to believe that most of the Arctic Ocean will be free of ice in the summers as soon as the mid-2020s." I've been looking at Barrow for a while now. It's ~32f or more most of the time now and melt ponding is comprehensive. Pity the Ice Mass Balance experiment is not running this year. It would have been very interesting. But probably too uncertain as to how long it could be out there I guess. ". That is, it's possible for the ice to be warmer than the air above it with help from the sun." Never without movement, you can take an ice cube at 0 and place it outside at -20, it will be warmer than air for a very short time. In nature without flipping an iceberg, or a sliding glacier bit, the top of sea ice or snow is always colder or as warm as air. Sublimation cools the top layer, with clear day sun full blast above at 30 degrees elevation, the air temperature can almost be identical to top of sea ice or snow but never warmer. In summer that is easier to understand, ice is equal or colder than 0 C, so if it is 2 C outside, ice will be of course colder never equal when above the freezing point, this gives an interesting mirage of the ice horizon rising, In winter this becomes murkier, but all proper measurements makes top of sea ice colder or same temperature as surface air. The reasons are a subject o study especially driven from the First Rule of Sea Ice Horizon Refraction. Optical observations are the most precise indirect temperature non intrusive reading possible, even with full sun blasting top of sea ice, seen from afar the horizon never drops below Astronomical Horizon, however with sea water the horizon easily drops below Astro Horizon when air is colder surface sea temperatures, this implies that temperature of top of sea ice, with or without snow is always colder or equal. Near Barrow or other areas too? Looking forward to Neven's Melt pond update in June. 11,348,485 km2（May 29, 2017）and 5th lowest measured for the date. I fear 'the June Cliff' is here and 2012 is invoking itself!! Last years Maxima massive disrupting decoiling wave breaking up of densest sea ice area reverberates to this day. Good clip, wayne. Jim Hunt said ice from Lincoln Sea would release into Nares Strait and that it is. It's interesting that so far this years extent decline is similar to past years, but it seems there are signs like the lack of steady ice north of Greenland and so much open water in the Chukchi that it could end up quite dramatic in it's decline. But what about all that extra snow? Will it contribute to melt ponds in June? Or will it slow the melt making this year not so bad after all? The situation is still fluid, if that word can be used - lol! sea water will add significantly to the warming warming mix, reducing clouds and green ponds will show, It doesn't look good. Check top of buoy thermistor temperatures when winds exceed 15 knots. Heat loss dissipates the photon warming. It's not so much seeing the conditions as the comparison with other years in the same fixed position. The history gives a good clue but Barrow has become sporadic over the last few years. the difficulty in predicting to the nearest Centigrade decimal. That is a good point , but I am in favor of shining Brian Cox brilliance as opposed to Australian senator, who in fact is in power, who does decide and influence wrongly on the course of Climate policy, but especially bring out that deniers are wrong, can't brag that they are wrong without showing it! If they have attention about their failings that is not necessarily good for their portfolio? It is time to reflect the sorry nature of sea ice and those intending in seeing it disappear further by their misconceptions. I found this reference for 'the atmospheric flywheel' and 'the sea ice flywheel' where it basically talks about the mechanics of everything associated with the Beaufort Gyre. Wayne, even if the fake conservatives in power at the moment are only campaigned for by the big miners iff they simply pretend they don't believe in CC you can rest assured that the relevant Govt. Depts and everyone in them know very well that it is infact on like Donkey Kong. How did they know in February last year that 2016 could've spelled the end for the myi? Because they did!! The big miners removed a sitting Prime Minister: combine that with the fact we bought copper internet with our mining boom wealth(so we could stay dumb and have nothing else to do but sell rocks of course!!!) and you will see that Australia is actually quite corrupt. I agree, but that is where the corruption fails, it makes huge business sense to carpet a small portion of Australian desert with solar panels, jobs galore, even for cigar chomping uber well overpaid CEOs. I think there is a huge segment of the working class population completely ignoramus about anthropogenic climate change, that is because they listen avidly to deniers and corrupt - or not - skeptics, rather than our best and brightest scientists. Ignoring them gave Trump and the rest of anti-Earth well paid in a comfortable life pollution maniacs. We can preach to the choir all we want, but we need to educate the "Trump base" wherever they are on the planet. turn to gardening in the Arctic. It is time to reflect the sorry nature of sea ice and those intending in seeing it disappear further by their misconceptions. Absolutely, Wayne, and I'm going to try to be back again next year, and maybe try some other stuff as well. I'm quite active on the ASIF, but not having to write hundreds of words every week (besides the hundreds of translated subtitles I make for work) is doing me a tonne of good, mentally. I'm making some progress on the house as well. With a bit of luck I'll be done with the big projects around this time next year. BTW, today I had the honour of appearing on Austrian radio for a couple of minutes to talk about Arctic sea ice, AGW in general and my mother-in-law. Next year there will be more rumble into the denialosphere jungle, good! Article about Trump announcement to bail out of Paris accord. The good news is it will take 3 years to fully exit and in the meantime he may be impeached, replaced and possibly the US will never miss a beat. Either that or get voted out in 4 years and replaced by someone that will get US back in. Ah yes, the leftist view. Less than 1/3rd of the warming trend is actually caused by humans, as per comparison with the admittedly gradual warming of the past 8000 years. I must say that I don't agree with Trump on much, but I actually agree with his speech today. Hopefully we will see a day when Wind and Solar are a much larger portion of U.S. power, but first we have to dispense with a different group of eco-freaks who oppose Wind, Solar, and Hydro power on the grounds that it kills a few insects or a lizard or a flight bird. You can't please everybody, after all. Yes, Iv'e done calculations on Wind and Solar for the U.S., and both CAN be done, but it requires about a $2 Trillion investment, which neither the government nor corporate America has available any time soon. A 30% cut in Cement? Lol. You can't even make the wind and solar farms work without cement! Hans, don't forget the 8.43 percent chance of dying of natural causes, while in office. Call me in about 15 years. I'll explain why climate models keep over-estimating the rate of warming and the rate of ice melting. Call me in about 15 years. I know Neven gave the best response to that comment but it does need to be said. Wade, come and talk to us in 5 years and we'll explain to you why the climate models were predicting catastrophic melting in 2070's and it all happened in the 2020's. Not only is your viewpoint incorrect about the Climate models overestimating the rate of warming and the rate of ice loss, but the overriding concern, in all climate change circles, is to work out why they keep UNDER estimating the impact. This is not a matter of conjecture. It is a matter of record. "...the overriding concern, in all climate change circles, is to work out why they keep UNDER estimating the impact." Yes, NeilT, most likely because the inclination is to err on the side of conservative modeling. Below is another feedback possibility that could happen again as the Arctic ice volume declines with historical information it happened previously just 12,000 year ago, a mere blink in geologic time. "The new paper describes one such event that occurred about 12,000 years ago in what is now the Barents Sea, a region of the Arctic Ocean stretching between Norway and Russia. There, at the bottom of the ocean floor, stands a collection of more than 100 craters, some as much as 3,000 feet wide and nearly 100 feet deep. The researchers believe they were formed by sudden rushes of methane from the seafloor." An anecdotal comment on Hans' seafloor methane craters...probably no clathrates here, and the scene is in the Western Gulf of Mexico, not the Arctic. experienced what may have been a related phenomenon. Somewhere over the continental slope off the Yucatan Coast, the yacht suddenly entered a region of several miles of smooth, glassy water, filled with bubbles "like champagne". Although there was a gentle sea running atop a moderate swell, the conditions of the sea surface suddenly changed to smooth and flat, a condition that persisted for many minutes as the vessel (a 39' cutter) pressed on at several knots in a fresh breeze. Then suddenly, as quickly as it had developed, the sea returned to its normal conditions of wave action, and the smooth, bubbly water surfacewas replaced by a more conventional sea. Tait has a background in both chemistry and physical geography, and his opinion was that a submarine landslide had exposed porous strata and a large amount of methane gas was released, probably in solution with sea water. As the plume approached the surface, the drop in pressure caused the gas to precipitate out of solution. He remarked that for a while he was afraid the boat would lose buoyancy and sink, although that obviously did not occur. He did mention he was happy that no one on deck was smoking! I was not present at this incident, but I did read his email correspondence with his professors at the University of South Florida and they suggested his explanation was as good as any they could come up with. They had never heard of anything like that before. They were baffled. One of the commenters to the story Hans linked to provided this link to a high resolution map of the bathymetry of the Gulf of Mexico. The entire Gulf Basin is an active area of petrochemicals production and exploration, but even at first glance, I can see features associated with salt tectonics reminiscent of the craters Hans' post refers to. of Mexico, not the Arctic." Elisee, up above your comment is another link to the same report in a different article. According to the information presented it occurred in the Barents Sea in the Arctic, not the gulf of Mexico. "Examining craters formed by methane eruptions 12,000 years ago, Andreassen and her colleagues determined that enormous amounts of methane in hydrate form — an ice-like mix of water and gas — must have dissolved as the 6,500-feet-thick ice sheets retreated from the Barents Sea north of what is now Scandinavia and western Russia." There is even a picture pinpointing the area it occurred. If you have information to the contrary though, that would be a huge story and I urge you to pursue it. "According to the information presented it occurred in the Barents Sea in the Arctic, not the gulf of Mexico." "If you have information to the contrary though, that would be a huge story and I urge you to pursue it." I was not disputing the information you linked us to, up in the Barents Sea. I was bringing up Capt Tait's anecdotal Gulf of Mexico incident as a similar, but possibly unrelated, phenomenon occurring in a totally different part of the world. The Gulf of Mexico is a geological province where there are enormous petrochemical deposits related to extensive salt tectonic activity, and the area has been the subject of extensive oil and gas exploration and development as a result. The Gulf Basin has been intensively scrutinized by geologists for its mineral potential, and an enormous literature exists. It is possible that there are mass methane releases in the Gulf similar to those ancient events you refer to in the Arctic, but that they may be due to completely different causes. It is well known that methane gas is often found associated with petroleum deposits and geologic traps formed by salt domes and other structures. We do know, from our experience in the tragic Deep Horizon incident, that clathrates do form in the Gulf of Mexico---they were implicated in the mechanical failures that led to the drill rig accident there a few years ago. Maybe that could have been worded differently. Perhaps you are right, and I apologize if I did not make myself clear. I can see how it could easily have been misinterpreted, especially if you missed the post I made immediately prior to it. I meant to corroborate, NOT contradict, the information you posted. Moreover, I suggest the 5-year cycle is very closely related to the 5-year minor El Nino cycle offset by a lag for travel time. The more GHG in the atmosphere, the more strongly Arctic sea ice and El Nino are linked. And, I think we owe a huge debt of honor to Professor Wieslaw Maslowski for his bold prediction of Arctic Sea Ice loss. No problem Elisee. It's easy to miscommunicate on a thread and I'm sure I played a role in that, but it was a good chance to post a more comprehensive article on the topic and your anecdotal information on the GOM was very interesting. Not sure it's conservative modelling Hans. I think it's as realistic as they can make it from the historical data and the reconstructions. The problem, as I see it, is that Anthropogenic AGW does not match any prior models so the models find it difficult to predict the future changes. Once we have destroyed the cryosphere they'll have a perfect model.